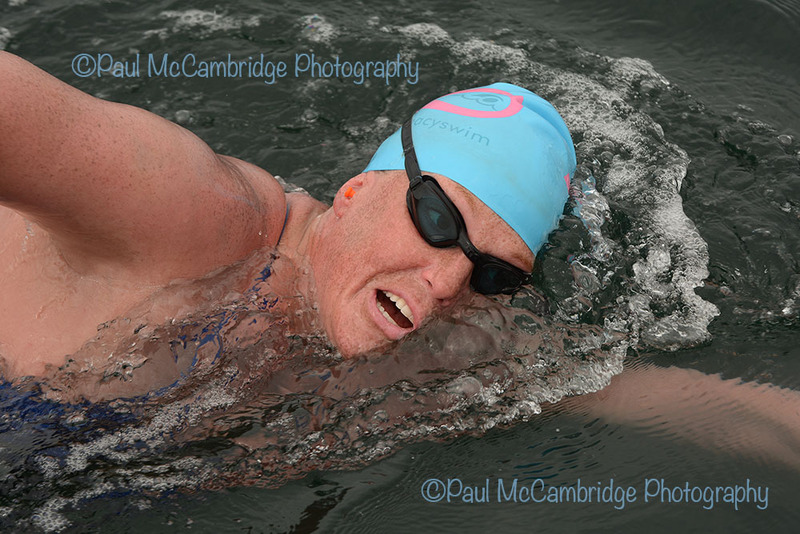 Michelle Macy, the second female to conclude the Oceans Seven series of open water swims, did so in great style by finishing her final swim, the North Channel, in the record time of 9 hours 34 minutes and 39 seconds. Just one week after first lady, Anna-Carin Nordin of Sweden, swam into the history books, Minnesota born Michelle was hot on her heels and finished the series also breaking Alison Streeter’s North Channel record, unbeaten for 25 years. At 4.30 am on Monday 15th July 2013, Michelle and her crew met at Donaghadee harbour ready to load onto the ‘Guy and Clare Hunter’, a refurbished lifeboat piloted by Quinton Nelson. Via radio the Coastguard wished “Best of luck to the swimmer” as we motored round to Robby’s Point. In the grey-blue light just before the sun rose Michelle climbed onto the rocks, raised her arm signalling she was ready and at 5.00am, just as the red orb of the sun crept over the horizon, began to swim towards Scotland. With her toe-nails painted in a new green varnish – “Resolution” Michelle was off. In the first 40 minutes speedy Michelle had covered 2.3 miles and after an hour took her first feed, a warm energy drink, from here on she would stop every 30 minutes. At 5 miles out, a seal popped his head up, he returned often during the swim, earning himself the nick name of ‘Curious George’, intrigued but keeping a cautious distance. Accompanied by kayaker, Conleth McCambridge to help guide her course in the chilly 13C water, Michelle soon encountered the North Channels renowned moon and lions-mane jellyfish. By 6.30 am Michelle had a lot of Lions-mane stings but, “My skin’s so cold I can’t feel them.” The hours went by with Michelle’s consistent stroke a steady metronome as each hand entered the water. 3 ½ hours into the swim and bizarrely a lone Nike football drifted past “How random!” said Nike employee Michelle as the ball was rescued by the kayaker, a good luck charm perhaps? At each feed Erin, friend and training partner, would don various silly hats and wigs to keep Michelle’s spirits up Large laminated photos of friends back home were held out to remind her how much she was being supported. 4 hours 42 minutes into the swim and we had crossed the half-way point, now officially in Scottish fishing waters, “That’s the easy half done.” said pilot Quinton, “the push into Scotland is the hardest part of the swim”. Michelle was getting colder and suffering more jellyfish stings but holding her pace and in the calm conditions with just a gentle swell, making good progress. By 12 noon, Quinton had the record in his sights and said, “If she can pick it up for 2 hours, we could have this swim finished.” Earlier quips about lunch in Portpatrick suddenly seemed within grasp. Michelle was asked to pick up her pace, “I’m doing the best I can! I’m not sure if it’s the cold or the stings but I can’t feel much.” By 1 o’clock tension was mounting, Michelle was looking strong but all were aware of how difficult the last couple of miles at the Scottish coast can be and with the tide bearing us south we held our hopes that she would get the record time. When asked for another hours push Michelle said “An hour is all I have.” We’ll have it then please. At 1.22pm Michelle swam face first into a jellyfish, stopping abruptly she let out an angry shout and slapped the water with two hands – on the support boat we weren’t sure if it was jellies or frustration but, “If she’s got the energy to shout and slap she’s got the energy to get this finished fast!” was Erin’s comment. At 2 o’clock we gave Michelle the news that the record was in her grasp – this would her last feed – it was time to get this done. After 9 hours 34 minutes and 39 seconds, Michelle climbed out of the sea at the cliffs just south of Portpatrick and finished the North Channel and her Oceans 7 quest. 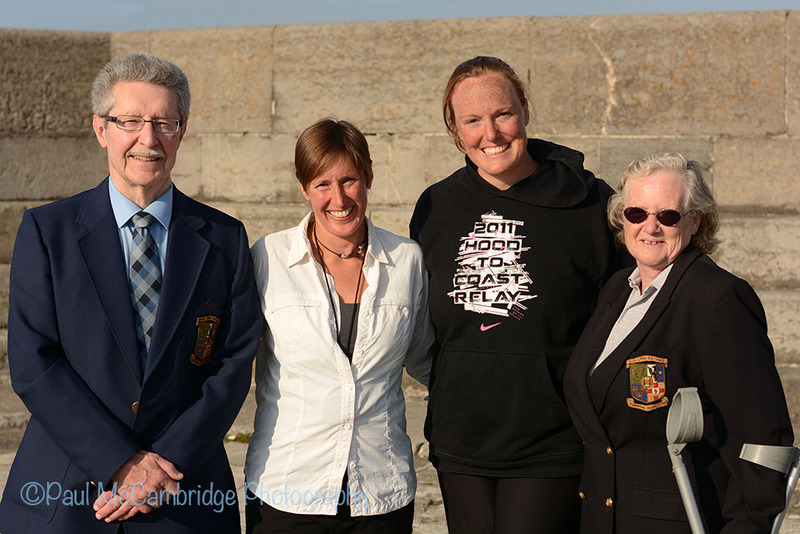 ILDSA President and Vice President Billy Wallace and Sheena Paterson arrived at Donaghadee as we unloaded the boat to congratulate North Channel record breaker and Oceans 7 swimmer, Michelle. Well done Michelle, it was a pleasure to be observer for you on a super swim and I look forward to Alaska!